The much awaited baby of this celeb couple has already become a celebrity in her own way and it will be interesting to follow her life story as she grows older and comes into the limelight. Will the Bachchan family be able to protect her from this limelight? The twitterazzi swooped down upon the news from the moment Bachchan broke the news on Twitter. Following the birth of the baby girl, obviously has got all the public hungry to see the first pictures of the baby and not to forget the glamorous mother, post-pregnancy. Earlier, a baby shower had been organized for the couple to shower blessings by her mother-in-law, Jaya Bachchan. Most of the big names from the film industry turned up for the baby shower. See Unseen Pictures. The baby shower was a grand affair, like all things in Bachchan family. Guests at the baby shower included Karan Johar, Sonali Bendre, Twinkle Khanna, Manyata Dutt, Raveena Tandon, Urmila Matondakar, Poonam Sinha, Neeta Lulla, Neelam Kothari, Abu Jani-Sandeep Khosla, and actresses like Saira Banu, Asha Parekh, Dimple Kapadia and Bipasha Basu. Well, all this is stale news now, since her baby is already born. So obviously now the focus is on the first born pictures. 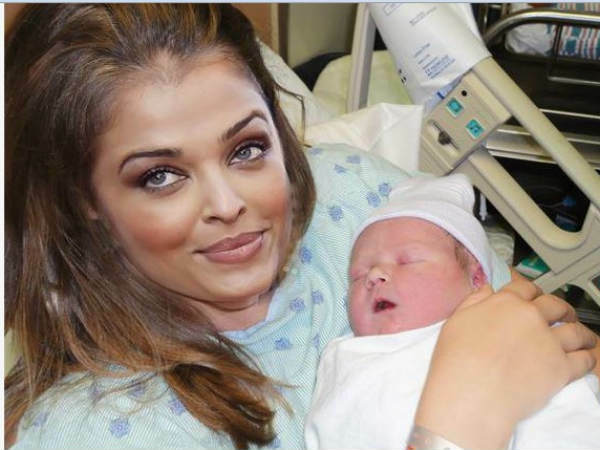 So here's the exclusive picture of Aishwarya Rai with her baby girl. This picture was circulated on a micro-blogging site soon after the delivery, but is claimed to be a fake!. Along with the photograph, Amitabh has tweeted: "Many claim that they have the picture of the baby from the net .. Ladies and gentlemen let me present you some follies ...This the picture that is being circulated .. a fake and morphed. and this is the original from where it was morphed .. my team did a stupendous job in finding it". In an earlier statement, Amitabh had expressed his displeasure over the issue, stating it was wrong to circulate such photographs as it was a personal matter for the family. There are huge bids for the first pictures of the baby girl by the media who are vying to be the first to bag these most coveted pictures. And apparently Mr Big B himself has made it quite clear that Beti B's pictures would not be revealed so soon. According to rumors the foreign media is trying to get hold of this big exclusive and have even offered the family a substantial sum of money running into crores.So sorry guys, looks like we won't be seeing those "baby blue" eyes anytime soon! Now we are all curious to know what the baby girl is going to be named. The naming ceremony will be held around Christmas this year, according to some news sources the Bachchan family is holding a very private naming ceremony at Pratiksha. Junior Bachchan has welcomed his Twitter followers to suggest names for his baby and hundreds of suggestions are pouring in on the micro-blogging site too.So if you have any suggestions, go ahead and help them out. See First Picture of Baby Girl Here. 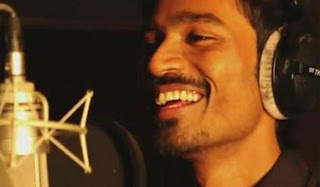 The song "Why this Kolaveri Di" sung by the Tamil actor Dhanush for his upcoming movie 3 suddenly became a huge hit on the internet and elsewhere, especially among the youth making it viral. The song was leaked on the net and as a result was officially released as a single track that created quite a stir with people talking about it and sharing it on all social mediums. Can you imagine that a nonsensical song like this captured the imagination of the nation and garnered more than 11 million views on Youtube? This is now the question that is being asked everywhere - Why This Kolaveri Di? According to a news site, "Kolaveri Di' means murderous rage and now it is popular even in other parts of the country. It is actually used to put off a cranky person in a group. The slang has been used by the makers of '3' to depict the anguish of a person who has just tasted rejection from the hands of a girl whom he liked." The song has become a hit among the millions of students and youngsters who hang around the various college campuses in Tamil Nadu and has gone viral on social networking sites like Facebook, Twitter and the video sharing Youtube. The song has created quite a stir, no doubt, some for the right reasons and some for the wrong reasons. For example, while certain top movie stars like Abhishek Bachchan and Rajnikanth went gaga over the song there were others like the lyricist, poet and scriptwriter - Javed Akhtar who is not impressed with it and tweeted the following, "KOLAVARI-D". Every one is praising the robes but the emporer is naked. Tune ordinary ,singing substandard.words an insult to sensibility.(sic)". Another Bangladeshi author also shared similar sentiments and tweeted, "Why does da stupid thingy Kolaveri di bcm popular in India,a country rich in its musical heritage?Anarchism or the hidden hippies coming out. (sic)"
I must say that I agree with his sentiments, specially after listening to the melodious tunes of Dev Anand songs a day after his sad demise, this particular song would have made anyone turn in his grave. I wonder if poor Dev Saab was the victim of this song, as a person of his caliber and the music that he has given us, it would definitely have given him a cardiac arrest. I really can't fathom what's so great about this song other than the fact that it's got a catchy tune. Is that all that's really required to make a song popular these days? I am begining to think that people don't actually listen to the lyrics of a song anymore, which is kind of sad! Anyway, each one to his/her own. Why don't you take a look at the video for yourself. And I ask you - Why This Kolaveri Di? DEV ANAND was undoubtedly and unarguably the epitome of romance in Indian cinema who became - a legend and a star with great zest for life and cinema. Who can ever forget him? Dev Anand breathed his last yesterday morning at a hotel in London where he had gone for a short holiday with his family. He suffered a cardiac arrest in his sleep in the wee hours of the morning and quietly passed away. He was 88. The name Dev Anand always brings to mind all the romantic songs of the era and I consider myself fortunate to have been a part of that era of romance. We grew up humming the melodious songs of his films that were full of promise, life and hope. I have watched most of his films and loved his unique style of swagger and acting. There was always something that we could carry away with us in all his films. Recently, one of his old time hits "Hum Dono" was released in color in all the theaters and I couldn't resist the urge to go watch the film. I dragged my husband (who likes fast action films mostly) to a late night show of the film and enjoyed every bit of it! The opening song "Abhi na Jao Chodkar" has always been a personal favorite and watching it in color (beauty of Sadhana and Dev Anand) set the mood for the rest of the movie. Although it seemed a little slow as compared to the fast paced movies of today's generation, it was still a treat to sit back and enjoy the songs and see Dev Anand in a double role on the silver screen after ages. It was definitely worth watching and am glad that Dev Anand did not agree for a remake of any of his old hits, like so many other movies are being targeted. There just cannot be another Dev Anand! Bollywood has lost a true legend and a "Jewel", an icon who will remain evergreen and young in our hearts and minds for a long time to come. He was an inspiration to many actors of almost five generations and will continue to inspire many more. He always gave us something new and unique in all his films and introduced many leading actors and actresses of his time like, Guru Dutt, Waheeda Rehman, Zeenat Aman etc...Most of his films were super duper hits and the songs were to die for. He brought in music legends like SD Burman, Sahir Ludhianwi and even RD Burman to make soulful music that touched every man's chord. His path breaking movie was "Guide" where he plays the role of "Raju the guide" and has an affair with a married woman (Waheeda Rahman). The movie went on to be a Jubilee Box Office hit in the theatres in India and abroad. Prem Pujari and Jewel Thief were movies that were close to his heart. Again the songs in the movies went on to become chart busters. Watch the videos below and enjoy. Dev Anand gave us romance, beautiful soulful music that remains evergreen even today and unmatched, beautiful films that had simple stories from life, and a plethora of beautiful heroines and actors. His films can be watched again and again, without getting bored and has something to offer to all age groups. He will always remain fresh, youthful and energetic in our memory, like he was in real life. He had a zest for life and cinema that was captured on screen with his award-winning performances. Dev Anand was described by most as a suave, westernized, Anglophile star, the first really cool hero of the Hindi screen. I pay my tribute to this great man and the evergreen legend...DEV ANAND! Let's take a look back at his most memorable movies: Hum Ek Hain (1946) – This was Dev Anand's first movie as an actor. Watch some of his greatest hits across the five decades on you tube videos here: Enjoy! 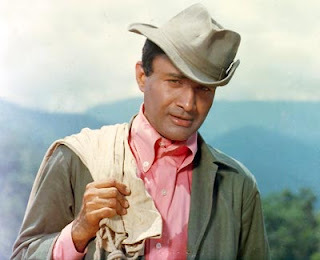 Farewell Mr. Dev Anand [Part 1] A Tribute To A Legend! Farewell Mr. Dev Anand [Part 2] A Tribute To A Legend!